If you really have nothing better to do.............with added incentive! It has snowed all day and its not the right kind of snow to go out in so I thought ~ maybe a little quiz? 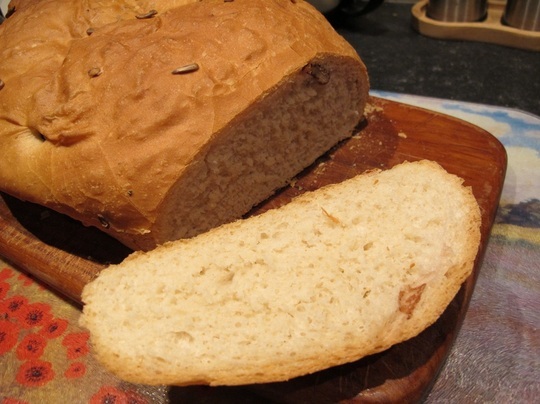 And if you manage all ten ~ help yourself to a slice of freshly baked bread! Please help yourself ~ it might help you do the quiz! And if that isn’t enough incentive ~ there might be a bacon sandwich later! Hi Sticki are these all garden related or anything? sticki has said they are flower names Sandra..
my fault san ~ i put that bit on later ~ suddenly realised i had forgotten the vital clue! i cant do anagrams either San but i couldnt think of another idea!!!! i can give you a clue if you like! ok, San will tell you the answers.............in a bit!! thats part of the slice of bread gone then! Sent a pm Sticki, thankyou I enjoyed doing that..
you are very welcome, thanks for doing the quiz lincslass, I shall go and have a look now. You get the bread Lincslass ~ there is christmas cake too if you like ~ 10 out of 10!!!! and so quick!!!! oh dont start me off ~ munchies are very nice ~ i have eaten far too much already!! might be on soup tomorrow! Six Karen? That's 6 slices of bread then? Which was the really difficult one? Um, well, er, yes all of them Sticki! I nacton egt yan fo meth ! Tub I nac daer ruoy rewsna ypmaB ! Good idea! Do you want a clue? Shall I tell you the first letter for them? I can't concentrate unless I have a slice of bread! That's cheating! ok, one slice! two slices each then ~ in exchange for some of lulu's chilli garlic butter? and i will tell you the first letter for each one? Well you are on the right track for number 5, and a bonus point for creative thinking!? Lulu and Stevie you should get number 3! oh sorry about the headache motinot ~ the clues havent been on very long ~ im very impressed! Lol....I can't remember now, I've forgotten all the answers already! I think it was the 11 letter one though! Hmm yes, it's much easier to set the question than do the answer! Well, no 3 is definitely not garlic butter!!! shame it isnt lulu ~ a quiz [not anagrams] about food would have been better ~ i nearly did that one but i would have got it all from google!!! i think lizziebee's suggestion is great motinot ~ shall try to remember it next time i have to work one out. glad it didnt really give you a headache! sorry i didnt mean to make them hard. its near where an oyster lives?? The trouble I have with this is that I'm hopeless at Latin botanical names, I tend to use the 'common' names...says a lot about me doesn't it? lol. I think they are mostly 'common' names . . . but then I've only done the first four and the last three . . . in spite of the clues! Good idea Sticki, thanks. only one is a latin name waddy, dont know why i usually call that one by its latin name ~ everything else i know by its common name! sorry! shall i tell you which one is latin? thanks sheila! only 3 to go? do you want another clue? I agree with Sticki that it's much easier to set the question than do the answer. Oh, yeah! 7 ~ never grown this but its white and delicate, goes well in bouquets! i hadnt realised how difficult this was kat ~ sorry. Oh, in that case I'll have a go...I'll PM you if I get any answers..but don't hold your breath! p.s the clue for number 5 is ~ in most gardens in THIS country. Phew, that number 5 was difficult! Please may I have the crust? You may Shirley ~ would you like butter and marmalade too or lemon curd? I will definitely do an easier one next time ~ not anagrams! All correct Shirley, join the roll of honour!!! I think I should offer to share the box of heroes i have here ~ for anyone attempting this quiz ~ sorry, it wasnt meant to be hard! Ooh, I've not eaten Lemon Curd for years ... must add to my shopping list! lovely stuff! ~ also nice mixed in with mascapone cheese and ratafia biscuits! Sainsbury's sell a "lemon curd" yogurt . . yummy! Thanks for the extra clues Sticki ... OK, now just 5 and 6 to go . . .
oh thats right they do and so do waitrose, and i think M and S ~ its delicious! whereas 5 may smell sweet? 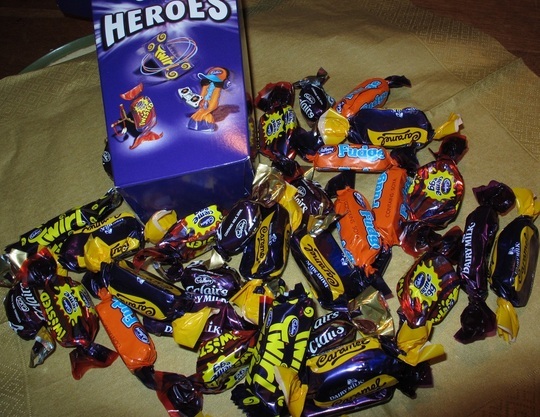 10 out of 10 Waddy ~ well done you ~ help yourself to chocolates! oh, thanks melchi! do you need any clues? that makes you about even then! good luck! Got them! I enjoyed that, Sticki, thanks. Is the snow bad with you? We haven't had too much here - I think we're right on the edge of it at the moment. All was clear from here to Glasgow and back on Saturday. we had 8" of snow on friday ~ it just didnt stop all day and then we had more! but most of the main roads have been gritted so its ok, i dont like driving if its icy though! i havent driven anywhere! you did well going all that way! We were fortunate that it was the corner of the country that was virtually unaffected by the snow. It was our daughter's 30th birthday, so there was a gathering of the clans - the only one who didn't make it was our eldest, who is in london. I think he would have risked it if he hadn't needed to be back for Monday morning. We got back at 4am. I think we saw about 6 cars and a dozen lorries all the way down the M74 and M6 - spooky! Oh my! virtually no cars on the M6 ~ that is incredible! but how lovely that you could make it. My oldest also lives in London, they didnt have too much snow on friday they said but as soon as they were out of london they would have hit it. you got back at 4 am?? you must have been tired. I should have driven down to devon but i thought it was too risky. I admit to having been somewhat tired! But not sleepy. OH fell asleep during my first stint (I can never sleep in the car) so I ended up driving most of the way, but I wouldn't have done it if I had felt at all sleepy. And we had promised ourselves we would stop somewhere for the (rest of) the night if necessary. But as it turned out, the journey was very easy. I had been keeping an eye on the weather forecast all week - I imagine Devon would have been a no-no. I dont like night driving ~ I will and can do it but i never feel i can see well enough ~ mind you ~ i cant tell you how many light bulbs i have in my kitchen and sometimes it still doesnt feel light enough!! how long does it take to do that drive? you did really well. You were very wise not to go, Sticki - long delays are no fun. I admit to enjoying driving very much. The drive to Glasgow is a good and straightforward one from here, and we regularly go there and back in one day. The driving time is between 3 and a half and four hours, not allowing for traffic or stops. We always have one longish stop and a couple to swap over. And there's usually at least one busy spell, depending on the time of day. This time, it was all quiet because we didn't leave until noon and Saturday pm is usually pretty empty on the motorway. that is amazing! i always wish i could do like they do in star trek [dont like the program though] 'beam me up' ~ i would be fine if i could just get there quickly! we generally travel on a sunday as its much easier, but if i go to london on my own i go by train! Well - I certainly wouldn't drive to London on my own, though I did drive eldest's new (to him) car back from South London a couple of years ago. I got a huge boost of self-esteem as a result! I'm going down to see eldest at the beginning of March, and I already have my train ticket. I love navigating, and I always enjoy researching a new journey - I don't have a sat-nav, but I bless Google Streetview. Google street view is brilliant! i love it! but im no good at navigating, im not sure why ~ i can do left and right but i think what i cant do is remember the plan/map in my head ~ especially when im under pressure at a difficult junction. i have my next train ticket too ~ the train line had a sale on!!! oh sorry sue, there are still a few chocolates left!!! Please could you PM me the answers to 5 and 6 Sticki? I'm supposed to be good at anagrams (huh) but it's driving me mad! Have some chocolates anyway Sheila for getting 8 right!!! my fault sheila ~ sorry ~ would you like christmas cake too? mmmgggrrrr... no thanks, my mouth's full of chocolate! Oh, ok, I will let you off! I called in at a cafe today and they were telling me about a cappoccino brownie that they make ~ sounded lovely ~ unfortunately they didnt have any today! So maybe brownies tomorrow ~ if you have finished the chocolate! Great - love brownies, and anything flavoured with coffee. Younger son gave me an M&S 'cappuccino' chocolate bar at Christmas, and it was SO yummy I ate it in one go, which I NEVER do normally! Oh i have had those ~ they are really good ~ and so is the lemon one they do!! i found a recipe the other day ~ little bit of sponge type trifle in the bottom of the dish, pour a little amaretto flavouring over it ~ or similar, place a few spoonfuls of ice cream over that then pour hot coffee over all of it ~ its really nice! sounds almost like a tiramisu sheila which i like very much! but the flake is not optional ~ its an integral part ~for me!! thank you, always lovely to have delicious ideas! Oh yes ~ a cook/chef should always try it out first ~ it doesnt take long ~ but you cant really make it much in advance! I have treated myself to a sticky toffee pudding!! Will buy the flake tomorrow so I can have that tomorrow!